If you're planning a shower remodel, you should take a look at the new options available in shower surrounds. Surrounding your shower will protect your bathroom walls from water damage and humidity. Traditionally made of ceramic tile and enclosed on at least three sides, shower surrounds can be expensive to build and a challenge to maintain. The grout between tiles and around the lip of the tub or drain platform can deteriorate over time, placing the supporting walls at risk for dry rot, mold and mildew. The grout can also discolor, making the enclosure look dirty, even when it's not. Newer shower surrounds use one of three types of installations: single tile, prefabricated, and slab installation. All three have advantages and disadvantages associated with them. This is the method most often associated with old-style bathroom showers. Like the roman mosaics of old, each tile is set individually or in small sections. The tiles themselves can be large or small, but the process is usually quite time consuming and labor intensive. To get it perfect, some previous experience helps too. The advantage of taking this route is that you can achieve old world charm and one-of-a-kind results without spending a fortune. 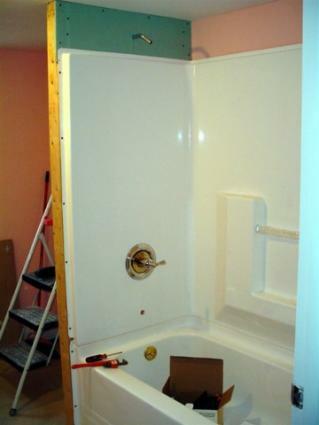 The most hassle free method of adding or replacing a shower setup is with a prefabricated surround. Created from a mold and typically made of fiberglass or polyvinyl chloride, prefabricated shower surrounds are relatively easy to install and make an almost foolproof water barrier, particularly one piece configurations. Three and five piece models may seem like more of a hassle than a one piece, but if your bathroom isn't square, they may be your best bet. If you want an easy solution that will look good and last, a prefab unit is the way to go. The down side is that most pre-constructed surrounds look like what they are, so if you want a unique look or a surround made of natural materials, you may be happier looking elsewhere. High-end surrounds are sometimes made of elegant natural materials, like granite and marble, quarried in large sections. Using these large stone slices can save time over laying individual tiles, but dealing with the weight of the slab and the logistics of putting it into place can present challenges too. If you're planning a one-man job, slabs probably aren't for you. The advantage of slab construction is that it looks amazing, but all that stone comes at a pretty high price, so be prepared to break into your piggy bank. When planning a retrofit, make sure to measure your existing setup carefully. This includes walls, ceiling height and the distance from outlets and HVAC vents. Don't rule out a prefabricated surround just because there's a window in the way. Most prefabricated units can be cut to allow for existing windows, or even fitted over them completely. Make sure the area is structurally sound and ready to go. It's better to discover and deal with problems like mold and dry rot now rather than later. For slab installations, there may be structural support issues too. Check with a plumber. The plumbing for your project may seem pretty straightforward until you actually start performing the installation. To be on the safe side, consult with an expert and get a green light for the project before you invest in materials. Whether you're working with a one piece prefabricated surround or are building a tile shower masterpiece, remember that the main purpose of a surround is to keep water away from your walls, so read all the directions carefully before you use any materials. Pay particular attention to required curing times and observe all safety suggestions for ventilation and the use of cutting tools.